Here at McCall Dentures in Indiana, we’re always excited to fit our patients with their dentures. In some cases, the results are absolutely life changing! We love what we do, and our patients love the results! Often, patients ask us how we make such life-like and amazing dentures. While we’d love to chock it up to magic, the process is actually pretty straightforward. 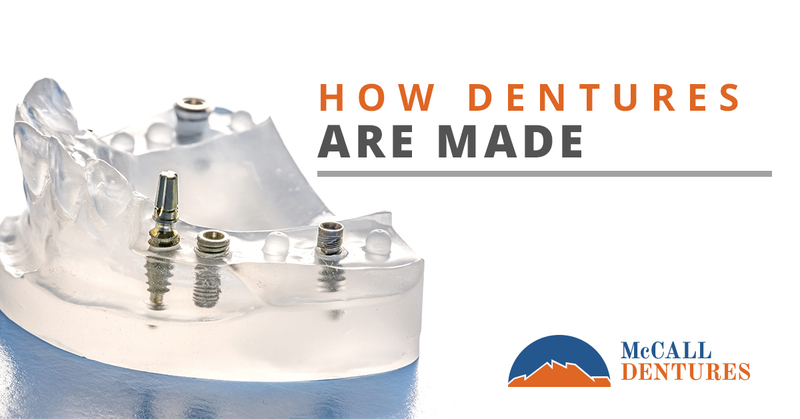 In today’s blog, we’ll briefly go over how dentures are made. If you’re looking the best, most natural looking full dentures available, contact McCall Dentures today! The process of making dentures has changed dramatically over the last several hundred years. Famously, President George Washington wore dentures made from hippo ivory, horse teeth, and donkey teeth. These were fitted into a crude retainer. Since that time, dentures have become much more refined, much better looking, and much easier to make! They say first impressions are everything, and this is true for making full dentures as well! An impression is made in wax. While making the impression, the denturist will apply gentle pressure to the gums. This is to simulate the pressure of biting and allows the dentures to better fit the gums. This impression is then used to create a diagnostic cast. The cast is typically made from gypsum, which is almost like stone. After the gypsum mold has been cast, a dental technician can begin the process of creating the dentures. A release agent is applied to the inside of the cast so that the dentures can be removed easily from the mold. The cast is filled with a durable acrylic resin. The resin is packed into the mold, and vises are used to force the two parts of the mold together. The mold, packed with resin, is heated to intense temperatures and the cast begins to harden. The cast is heated for roughly eight hours. After this time passes, the cast is removed from the mold. Using a model of the patient’s mouth, the denturist checks the fitment and placement of the dentures. This is a multi-step process that requires several periods of grinding and polishing to ensure that the dentures fit properly. Once they fit properly, they are finished with any details the patient has requested. If the patient is using a removable type of denture, at this point the dentures are ready to be used. If the patient is having dentures implanted, this requires additional steps. The denturist drills holes into the jaw bone and installs an anchor in the jaw. The hole is allowed to heal, and another surgery is performed to connect a metal rod to the implant and attach the replacement tooth. McCall Dentures in Indiana is committed to providing its patients with the best dentures available. Each set of dentures is finely handcrafted using superior quality materials to create dentures that are strikingly lifelike. We can provide our patients with full and partial dentures to meet their needs. We also offer immediate dentures that are available the same day as a dental surgery if the patient needs a temporary denture solution while their handcrafted dentures are being finished. Enjoy your smile again. Contact McCall Dentures to schedule an appointment today.